Read about stretching precautions and contraindications here. 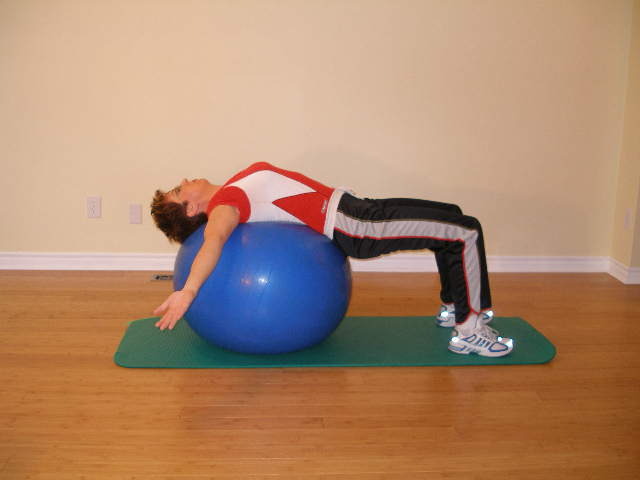 Lie back over the exercise ball with the ball centred under your thoracic spine. Allow your back to gently arch over the ball. Reach arms overhead keeping your elbows straight. 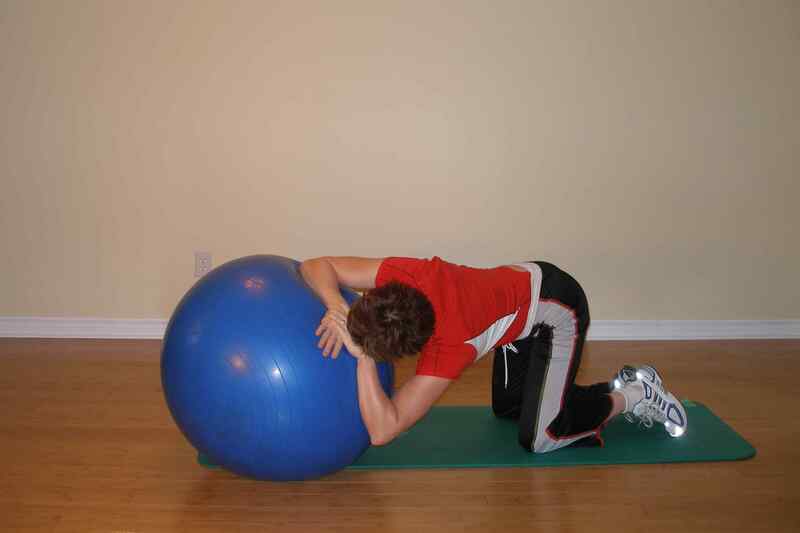 Put your exercise ball on the floor in front of you. Place your feet wide, knees bent, and keep your back straight. Bending one knee, lunge to the side until you feel a stretch on the inside of your thigh. 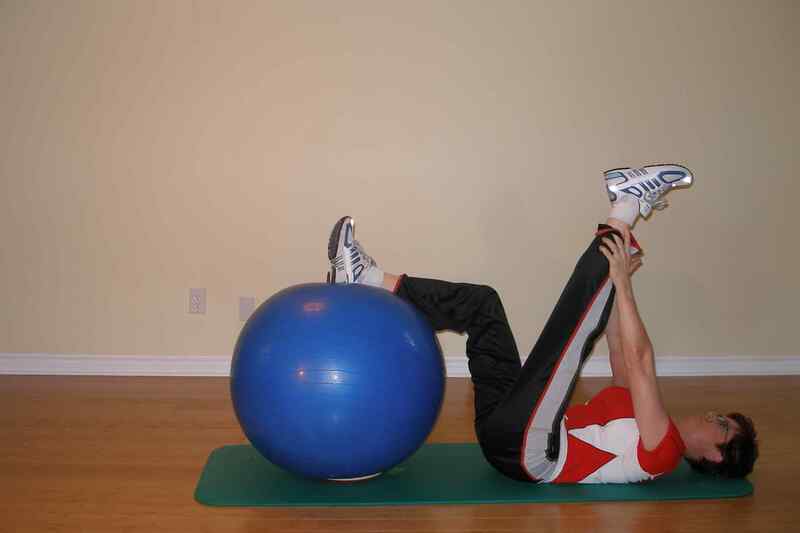 Sit on the exercise ball with a neutral lumbar posture. Chest should be up, shoulder blades down and back, and head back over your shoulders. Keep your feet flat on the ground shoulder width or slightly further apart. Roll the ball to the left, bending your left knee and reaching your left hand to the ceiling. Stretches: Latissimus dorsi, trunk side flexors. 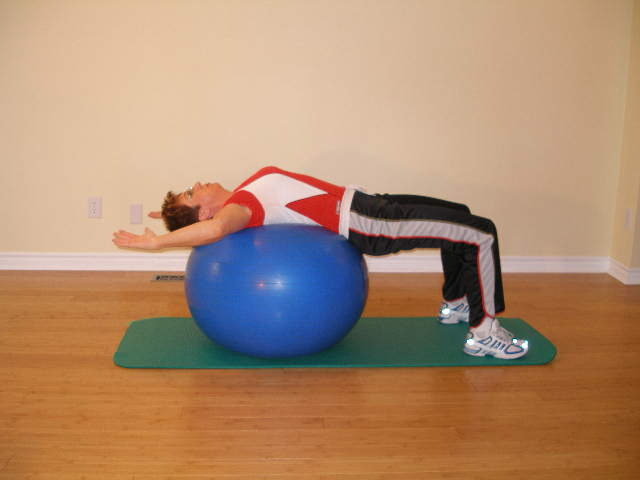 Start by lying prone over the ball with chest slightly raised. Your exercise ball should be centred under your belt line. Hands rest lightly on the floor in front of you. Take one hand and keeping your arm straight reach up and back toward the ceiling . Stretches: Trunk rotators, spinal ligaments. Lie face up on the floor with your heels resting on the ball. Roll the ball in so that your knees are at 90 degrees. Grab one leg and pull it up while maintaining a straight or only slightly bent knee. Try and keep your lower back and pelvis on the floor. 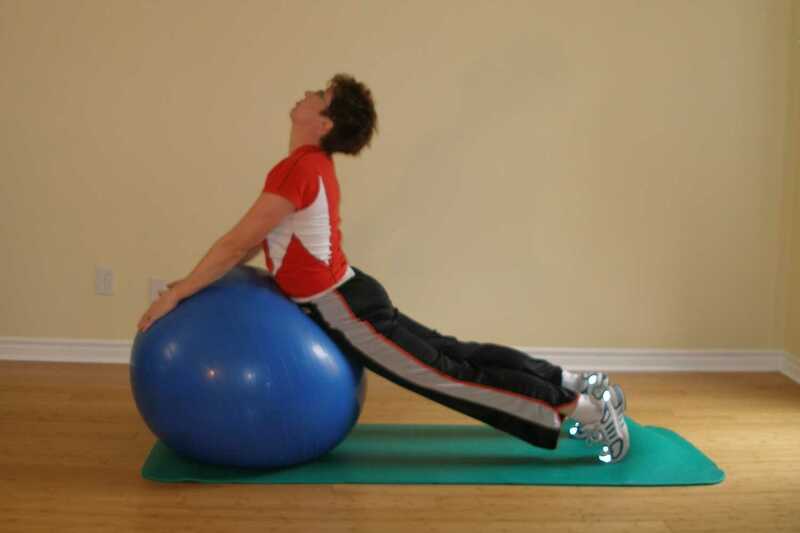 Start by lying supine on the floor with your heels resting on the ball. Cross your ankle over your thigh and let your knee fall outward. Roll the ball toward you with your heel so that you feel a stretch in your glutes. Lie face up on the floor with your heels bent and your feet flat on the floor. Hold the ball in your hands overhead on the floor. Roll your knees to the side while keeping the ball stationary. Hold this and then repeat on the other side while keeping your feet on the floor. Kneel on the floor and place your forearms across the front of the ball. Rest your head on your hands. Roll the ball and your hands to one side gently rotating your middle back. Make sure your back is flat. If not, you may need to move the ball further away from you. Kneel on the floor and place your hands across the top of the ball. Let your back sag into the stretch. Sit back on your heels as you roll the ball forward. Hold this position. 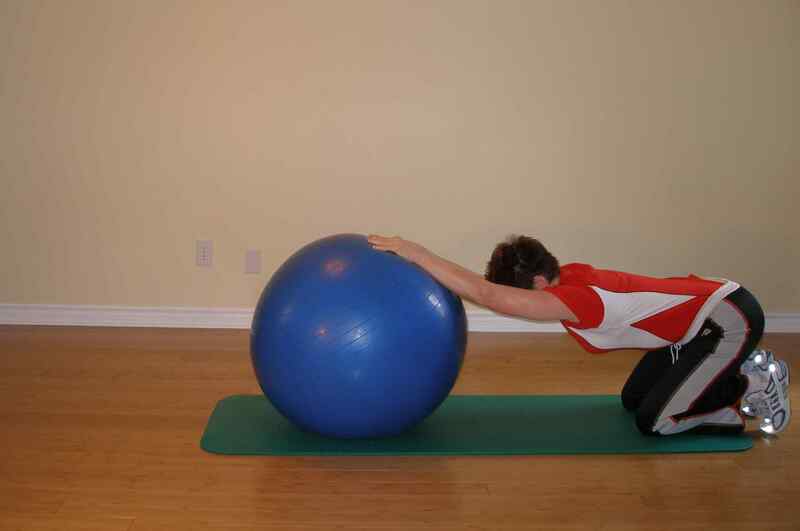 Kneel on the floor behind your exercise ball and place your hand on the side of the ball. Roll the ball across in front of your body to the opposite side as you sit back toward your heels. You should feel a stretch down your side from your shoulder blade to your hip. Kneel on the floor with the ball on your right side and your right hand resting on it. Lower your chest toward the floor and support your weight with your left arm. 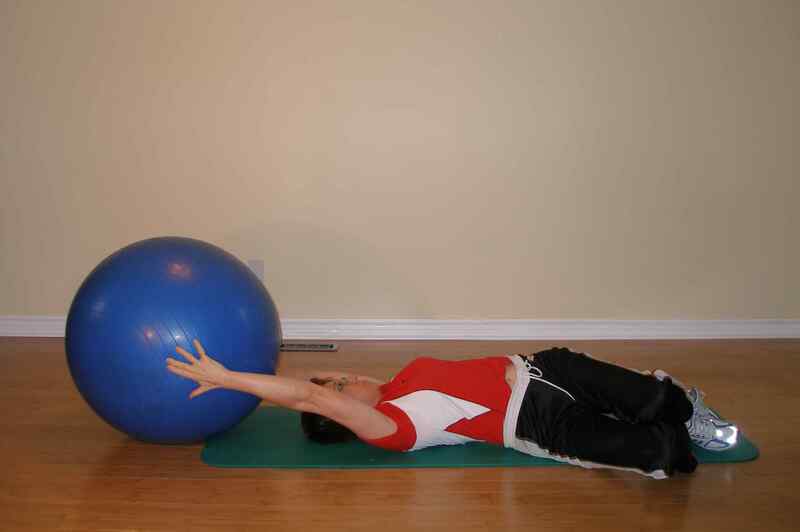 Turn your trunk away from the ball to feel a stretch in your right pecs. Lie over the ball, extending your outer leg and reaching over head to stretch sideways over the ball. Lie forward over the ball so that your belt line is centred over the ball. Raise your leg and arm off the floor, reach around and grab your ankle. Lift your leg and pull your heel toward your buttocks to feel a stretch on the front of your thigh. Sit forward on the edge of the ball with feet wide apart. Pull your chest up and roll the ball forward until you feel a stretch on the front of your hip. Make sure your feet are both facing in the same direction and your back heel is off the ground. Sit forward on the ball with feet wide apart. Turn your body over one leg. While keeping your back straight, lower your chest toward that side. Roll the ball back to straighten the knee. These exercise ball exercises require you to sit forward on the exercise ball with feet wide apart, hands on your hips or thighs. Roll the ball slowly to one side until you feel a stretch on the inside of your thigh. Sit forward on the exercise ball with feet wide apart, hands on your hips or thighs. Rest your elbows on your knees or, if you are flexible enough, put your hands on the floor. Gently roll the ball back and pull your chest up to increase the stretch in your thighs and buttocks. Hold this position only briefly. Lie forward over your exercise ball and rest your hands over the other side of it. Push up to straighten your elbows. 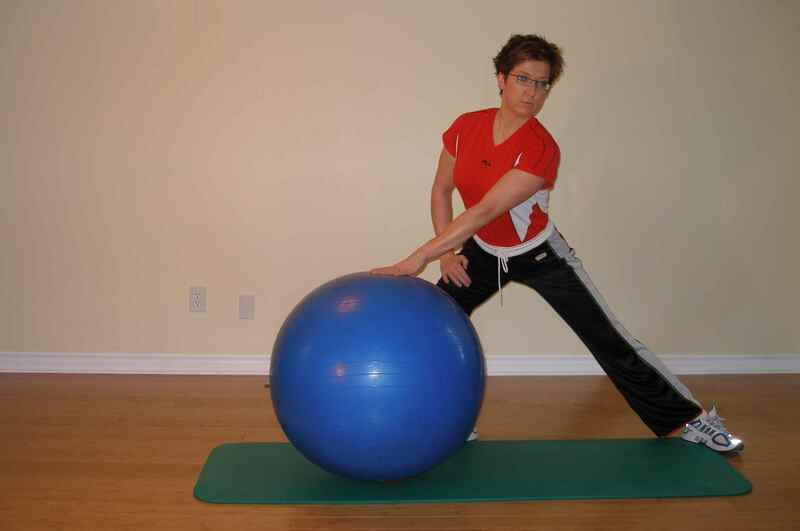 Keep your pelvis in contact with the ball and let your back sag into the exercise ball. Stretches: Hip flexors and spinal ligaments. Bring your arms up so that they are at 90 degrees to your body and your elbows bent to 90 degrees. Allow gravity to pull your elbows back and your hands to the floor. Bring your arms up so that your shoulders are at 90 degrees to your body and your elbows straight. Allow gravity to pull your arms back to the floor. Kneel down onto one knee with your other foot behind you. 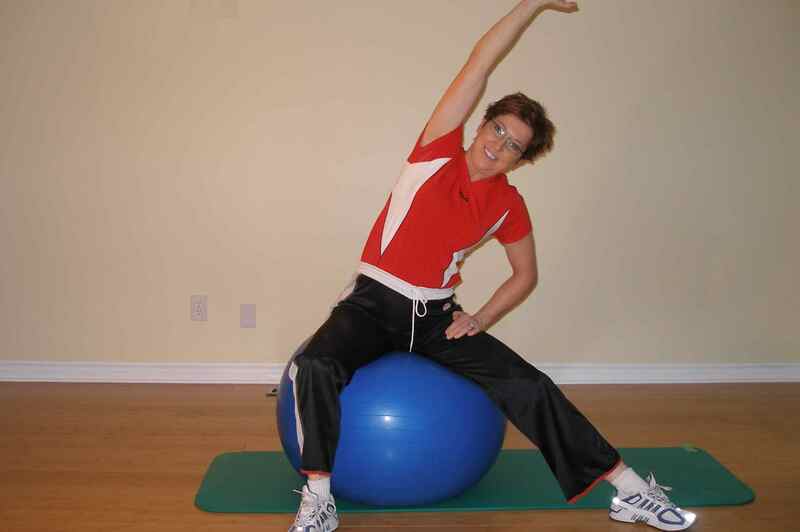 Holding the exercise ball in front of you bring your arms up so that your shoulders are at 90 degrees to your body.